Big donations help improve student learning, faculty and scholarship. Milestone gifts propel UNT forward, resulting in renewed optimism for the future. UNT's new state-of-the-art Apogee Stadium is the largest building project in UNT history. Phil McGraw (’76 M.A., ’79 Ph.D.) encourages new alumni to change the world. Read the full transcript of Dr. Phil's commencement address. Students in UNT’s REAL communities bond over common academic interests. The groups have reunited each year for decades. A new era in Mean Green football is taking shape. With the opening of Apogee Stadium, UNT's economic impact reaches even further. Students from the Universidad Autónoma del Estado de México learned English this summer. Watch a montage of selections from the six-time Grammy-nominated One O'Clock Lab Band. Charn Uswachoke (’73 M.B.A.) learned about business and soaked up music at UNT. 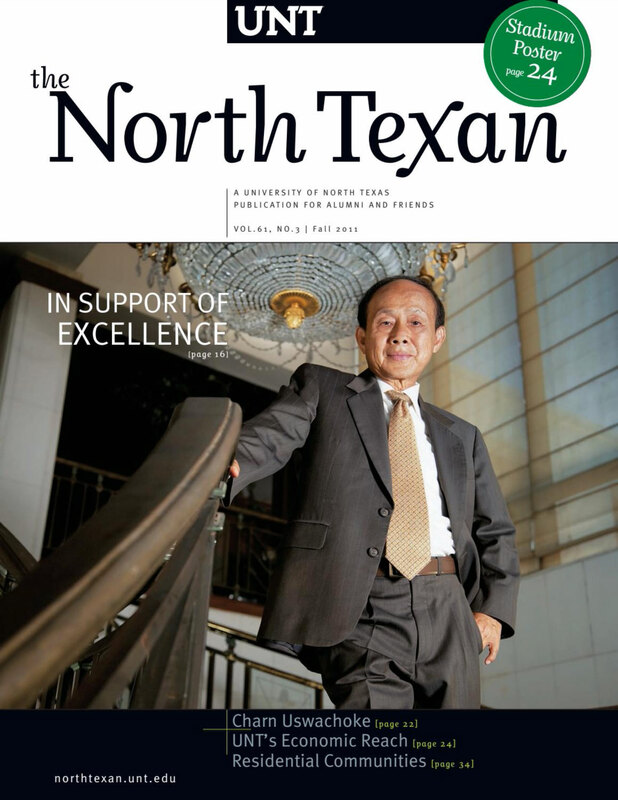 UNT's efforts in building international research recently have earned prestigious recognition. Rahul Panchal (’04) turned a dorm room experiment into a spicy business. Paul Voertman's long commitment to UNT began in kindergarten. Purchase a UNT-branded license plate and show you're part of the Mean Green Nation. Nick Cave will serve as the artist-in-residence for UNT's Institute for the Advancement of the Arts. A look at the artist residency of Nick Cave at UNT. All alumni are invited to the new pavilion dedication ceremony. Dancing flutist Wayla Chambo performed at the National Flute Association convention. Four old letterpresses are newly renovated, thanks to four graduate students and a professor. Legendary recording star and former UNT student presents “An Evening With Pat Boone." UNT and One O'Clock Lab Band alum Mark V. Gonzales ('96) took home a Grammy this year. How can you show your Mean Green spirit?